As daft rides go, this was going to be a real test. The last big ride Dave and I did was big enough – could we ride an even harder and longer route? The route was planned. Dave spent several afternoons checking his plan and riding sections of the 131 mile monster and the weather watching began as the date drew near. By the time I arrived in Morland though, the weather was fine, it was daylight and there was even some sunshine – result. We headed west towards High Street. 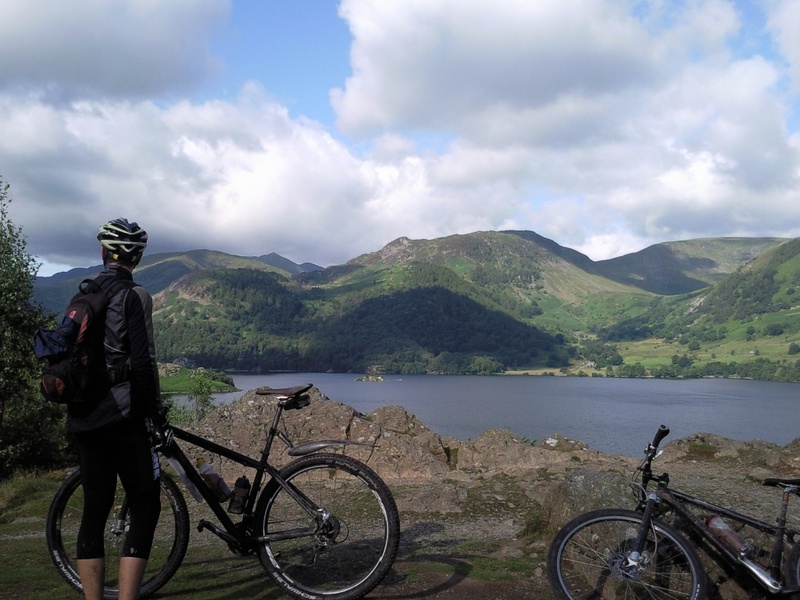 A fast road section was followed by gravelly trails and moorland singletrack, then a great trail that followed the shore of Ullswater – mostly fast and narrow but with sections of boulders, then a huge climb to the summit of High Street itself. Eventually we arrive back at the road – ‘big ride number one’ complete. Now for the next one. We rode to Staveley (I didn’t stop at Wilf’s for the first time EVER), Burneside and headed north to Borrowdale. Eventually riding underneath the M6 and heading south towards Howgill we prepared ourselves for the next big climb. 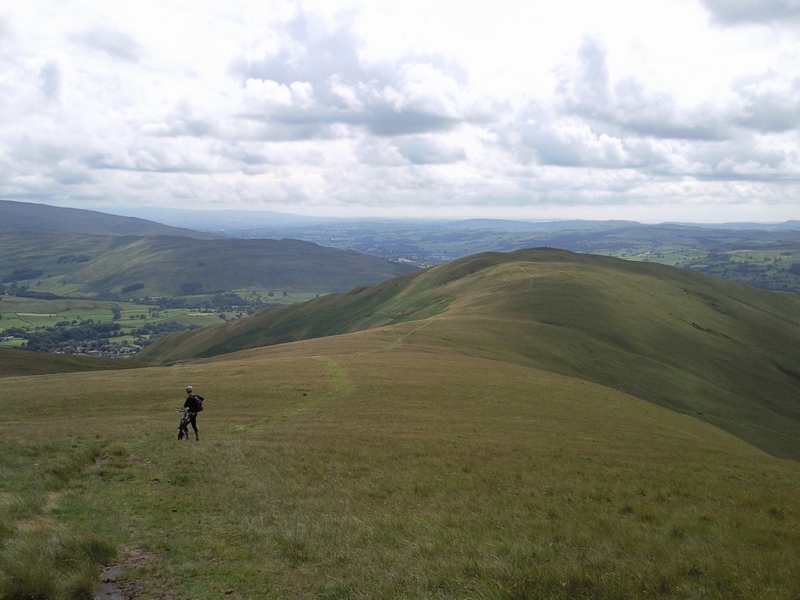 Almost reaching Sedbergh we turned left and headed towards the summit of the Calf. After a quick photo/food/view stop at the top, we rode the utterly ace singletrack that just goes on and on and on and on down the valley to Bowderdale. Another short road section, then across Crosby Garrett Fell towards another huge climb over Cross Fell. We were well over 80 miles into the route by now, we’d not stopped much at all apart from map reading/food scoffing/bodging a torn tyre with an ID card/going shopping for more water stops but we were getting concerned about the shortage of daylight…it was looking like we’d need to leave the final High Cup Nick section for another day, given we had one small LED light between us. We pressed on and maintained a good average speed to Blencarn where we got on with the job of climbing Cross Fell. We had almost reached the summit when we had to make The Decision. With only an hour of daylight left, we would be pushing our luck to continue even on the modified route – leaving no margin for error or delay probably wouldn’t be a good idea so we turned around and rode back down again (which was fun). All we had to do then was find Morland (where we’d left the cars)……. Eventually, we made it back to Morland after a ride back that just seemed to go drag more than it should have done. Dave’s rear tyre was going down and was flat by the time we got back so I suppose it dragged even more for him but we made it back in one peice, our intended route altered to avoid getting eaten by werewolves but another mammoth ride in the bag. After checking the ride stats: 116 miles, 17266 feet of ascent. Lesson to you there, bring lights! Looks a fab ride! Did you bring your garmin? If so any chance of a .gpx of the route? no GPS this time I’m afraid – the battery only lasts 7 hours anyway. Sounds like there’s enough there for two or three epic rides. It all loooks fantasitc! 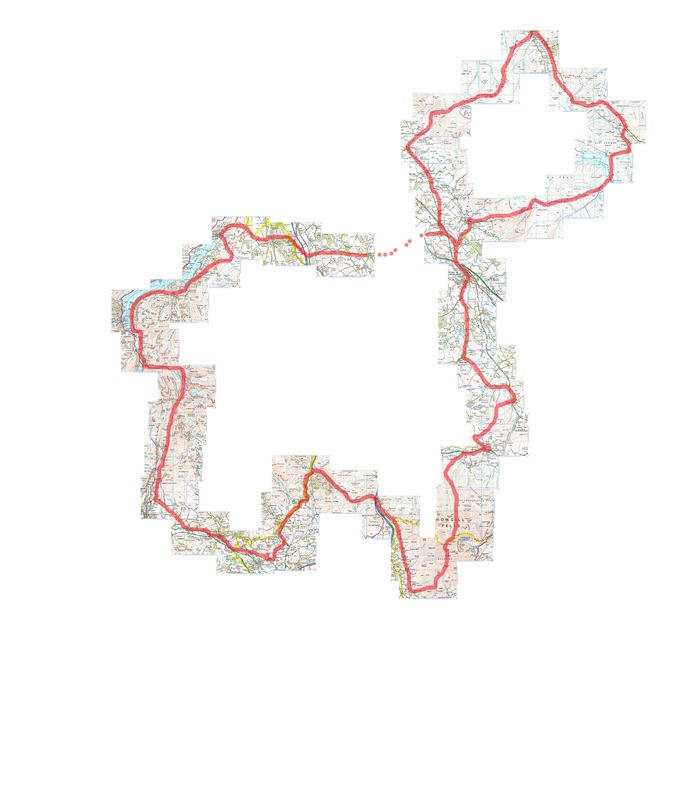 I have a plan evolving in my mind for a truly evil Lakes circular route…. think 4 x 3 Peaks for distance and height gain. I thought you’d gone and done it when I saw your post. 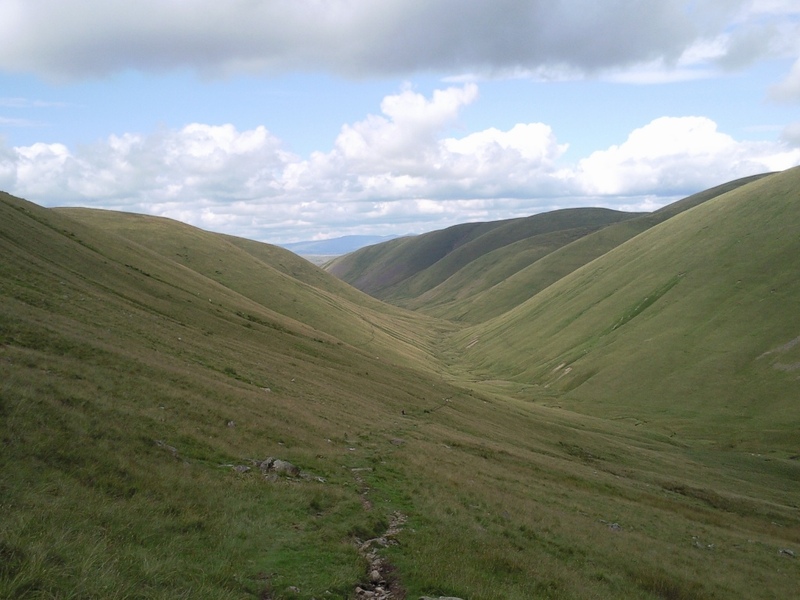 What is rich’s lakeland-lugger route? That is a long ride. It might be doable in a day if the detour to Black Combe was chopped off. 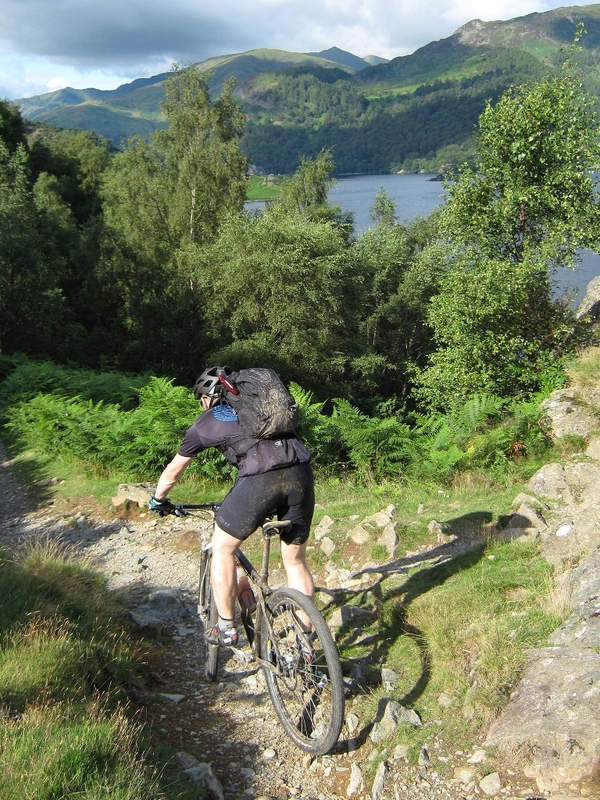 The ride up Iron Crag is very hard because the path disappears once you leave the valley.